Ruth Carr sends many runner to Pontefract but her raid on the West Yorkshire venue looks like it could be a good one on Monday afternoon. Going back a couple of years, Carr wasn’t really a trainer to follow during the first half of the season, but she used to thrive on a golden spell right in the heart of the summer. Now she has her horses ready from the off, and that has seen her become a more well-rounded trainer, as well as a far better one. 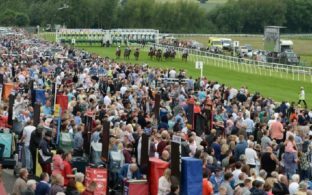 Carr sends four runners to Pontefract on Monday, and in particular two of them appear to have a very good chance of winning. We have seen them both in action recently, the first is Poyle Vinnie who won on the all weather last time out, and the second is Foxtrot Knight, who was an eye catching second on the artificial surface. Starting with Poyle Vinnie, he runs in the feature race on the card, the five furlong sprint at 3:20. His recent run on the all weather takes him up from a handicap mark of 82 to 85, which is fair considering his success. However, you only have to look back at his form last season to see that is still a mark he can run very well off. He placed off marks higher than this one, and should again go close here. He travelled up with the pace at Chelmsford and from stall 4 on Monday, he is in prime position to do the same again. He doesn’t need to lead though, and I could see him getting a nice lead round from Sandra’s Secret, who is a front runner coming out of stall one tomorrow. This is a good race, but Poyle Vinnie is handicapped to win more races off his current mark, and looks sure to go close in this decent sprint. The second runner of interest for Carr comes later on the card in the 5:20 in the shape of Foxtrot Knight. Anyone who saw this horse run last time out will no doubt be backing him here this afternoon, after he finished quickly down the outside to claim second at Wolverhampton. The all weather track in the midlands is very difficult for horses coming from the back, so to see the horse stay on so strongly at that track in particular was very eye catching. He has a previous win at Pontefract under his belt from last season, and looks the kind of horse to relish this uphill finish, allowing him to reel in the front runners. Just like Poyle Vinnie, Foxtrot Knight was running well last season off marks higher than this one today. He comes here off just 65, after running well numerous times off marks in the 70s last season, and winning off 68 at this course last May. There is plenty going for him, and this race doesn’t look to be anything other than a run of the mill northern sprint in which he can go very close in. Of the four that Ruth Carr sends to Pontefract, these two are the main hopes of a winner for her. She has shown yet again early on this season that she can get horses ready for this time of year, and we have seen both of these run well on the all weather ahead of moving onto the turf. They both look to have leading claims both based on their recent run and those from last season, and both look worth a bet on Monday afternoon. Receive our latest tips straight to your inbox! Whilst we will do everything possible to give you winning tips, nothing is guaranteed so please ensure that you always GAMBLE RESPONSIBLY. When the fun stops, stop. Odds and returns may vary depending on when you’ve put the bet on. Fill in this form to get access to our premium tips. If you already have an account, please sign in below. Receive our daily tips and offers straight to your inbox. I am 18 years old and want to receive tips & promotions from HorseBetting.org.